The most unpleasant truth he taught us is that we are a whole country in denial about death. We can’t put it off any longer. None of us is getting any younger. You’re going to have to talk about it sometime. And you’re not going to like it. As inevitable as gravity, one day you’re going to be so old that your body itself will rebel against you – an engine brought down by longevity; weakened pump, torpid processing unit, rusted joints – but worse… pain. Constant, unending torment. Like hell. Only it’s real. And when that day comes, we’re all going to need someone like Dr. Jack Kevorkian, who would give us the choice to end our own lives once its “quality” becomes non-existent. Told you you’re not going to like it. Released on the heels of a television movie covering the same subject (YOU DON’T KNOW JACK, starring Al Pacino), KEVORKIAN is a documentary about Armenian-American Dr. Jack Kevorkian – the infamous “Doctor Death” – who assisted over 130 people in euthanasia procedures (doctor-assisted suicide) between 1990 and 1998. He was incarcerated for “second-degree homicide” in 1999 due to a technical/legal miscalculation on his part, and served eight years in a Michigan prison. Director Matthew Galkin catches up with the good doctor after his release from prison. Kevorkian is 79, spent physically, yet very mentally alert. And – like Galileo and other great men before him – stultified, beaten into submission never to express his ideas in public again. 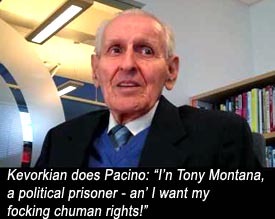 KEVORKIAN profiles the man as a painter, musician, inventor and right-to-death advocate, focusing on merely a few months following his 2008 bid for Congress. At the same time Obama is winning the presidency, Kevorkian loses his race. Through politics, Kevorkian is intent to promulgate his policies of ending suffering. If the right to life is acceptable in American society, then conversely, so should the right to death be. He cites the 9th Amendment for “individual rights” espousing that it covers suicide as a basic human right. Kevorkian has no patience for politics-as-usual: “A platform is something a politician stands on before an election and sits on after an election.” In his characteristic head-on truthful manner, Kevorkian attacks his task as campaigner: “Politicians are liars by definition; they never say what they believe or think, and they have nothing but platitudes, clichés and soundbytes.” He is not afraid to offend people who do not fully understand why they support him. Unlike other politicians who would gladly accept a vote from a citizen even if blindly cast, Kevorkian feels compelled to explain to the Great Unwashed at his meager rallies exactly why they should support him rationally, not emotionally. And given that Americans – as Jack Nicholson once so aggressively put it – “can’t handle the truth,” Kevorkian naturally loses his election bid. We hear from many key players in Kevorkian’s life: assistant Ruth Holmes, former assistant Neal Nichol, former lawyer Geoffrey Fieger, sister Flora Holzheimer. This documentary is not for everyone. If you are a close-minded christian fundamentalist who refuses to understand Kevorkian’s ethos – ending suffering – then you should probably waste your time praying to your non-existent fantasy cult deity. Kevorkian’s protestors insisted on straw man arguments, painting Kevorkian as a seeker of the sick and weak and killing them arbitrarily, as if he was on a crusade to wipe out everything from cancer down to the common cold. No, he was approached by people with chronic pain, who knew they could count on him to end their suffering. The American way of life has become illusory. We lead the lives of prisoners while we boast about free speech, free press and free religion, none of which we actually do enjoy in full. — Carl Shapiro, writing about Henry Miller’s works. I want to be there to see what happens when the protestors have used up the fabric of life and their children have left them to die in nursing homes; when all their prescribed drugs are doing nothing for them except creating more yellowed urine; and when their pain receptors are screaming like shattered glass days and nights and afternoons and birthdays and public holidays. Like Henry Fonda, I just want to be there. Hardest thing for most people to admit is not that Kevorkian was performing assisted suicides; the hardest thing is to admit he was right. Starring: Jack Kevorkian, Geoffrey Fieger, Ruth Holmes, Neal Nichol, Flora Holzheimer.